If a certain volume of substance X weighs less than the same volume of substance Y, then X will float in Y.
That’s why a beach ball floats in water. A beach ball full of air weighs less than a beach ball full of water. Archimedes’ Principle tells us what will float and what will sink, and it works for both liquids and gases. Of course, you’d need to subtract the weight of the balloon material itself from that buoyancy, but in practice this is a small force given the types of material used (rubber, nylon, mylar). A 1 m3 (one cubic meter) spherical balloon would have a diameter of 1.2 m — that’s a pretty big balloon. Typical toy balloons have a diameter around 0.3 m, a volume of 0.01 m3, and a buoyancy only slightly greater than their weight. Tie a longer string on it and it might not float. As a balloon ascends into the air two things happen. First, the air density decreases the higher you go, and that decreases the buoyancy. Second, air pressure decreases the higher you go, and that allows the balloon to expand, which reduces its density and increases its buoyancy — up to limit. Toy balloons would eventually burst at an altitude of around 10 km. That’s for a balloon filled with pure helium, which is rarely used in toys. 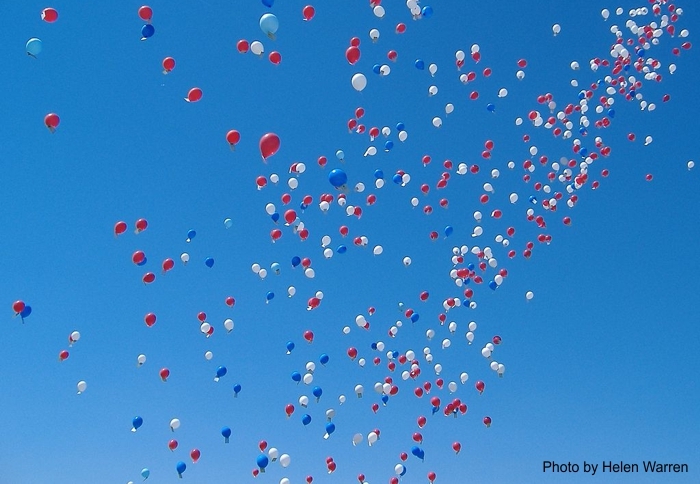 Balloons you get at a party store or carnival typically contain a mixture of 50% helium and 50% regular air. They’ll still float, but helium is expensive so you only get as much as is needed for buoyancy. These balloons max out around 5 km altitude. But most of the balloons won’t even make it that high. Most toy balloons are made from biodegradable latex. Air temperature drops with altitude at a rate of 6.5 °C (12 °F) per kilometer, and the latex becomes more brittle in the cold, so it can only stretch so far before bursting. Unfortunately, that’s the problem with mass balloon launches. When all those balloons have floated away they’re out of sight and out of mind. But ultimately they’ll burst and become nothing more than litter. I know that balloon launches have long been used for celebrations, but there are compelling reasons for eliminating the practice. Beyond the obvious littering problem, fragments of burst balloons are often ingested by wildlife. That causes issues in digestive systems and sometimes death. It’s related to the wider problem of plastics pollution, which I’m sure you’ve heard about in the media. Also, although it won’t hurt an aircraft to hit a balloon, if a balloon is sucked into a jet engine it could cause damage. Not all balloons are bad. 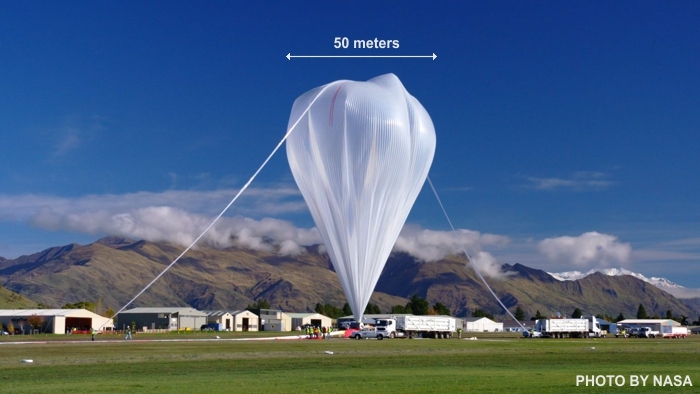 Scientific research balloons are used for purposes from weather to astronomy to resource and pollution monitoring. They’re built from different materials, can expand more before bursting, use 100% pure helium, and often reach altitudes over 30 km. The photo below shows one of these balloons preparing to launch. By the time this one reached maximum altitude it had expanded to a diameter of 114 meters. You asked if a balloon could float all the way to space. The current record altitude of 53 km is held by BU60-1, launched in 2002 from the Sanriku Balloon Center at Ofunato City, Iwate, Japan. That’s not even close to space, which officially starts at an altitude of 100 km. No balloon could ever do that, and I hope you now understand why: Whatever material you use for the balloon, regardless of large it is, and no matter what you fill it with — it will always weigh more that the same volume of “empty space”.